Blu-ray is a high definition optical disc and can store high definition information. Although it looks similar to general DVD in shape and size, it is totally different from DVD in technology. The data is read and stored by a blue laser in blu-ray disc. Similar to DVDs, many different copy protections are applied on blu-ray. But what when a blu-ray disc is broken, stolen or misplaced? Only a backup data can help you out. But the very next question arises. How to back up data from a blu-ray disc? The one of the best answer is Blu-ray copy from DVDFab, software which can remove any blu-ray protection and can serve the data of blu-ray as a back-up. You can then copy the whole data onto another blu-ray disc or you can save it on your hard disk as an ISO image or blu-ray folder. Whatever the encryption format be, Blu-ray copy can decrypt the format including MKB v26 and bus encryption, BD-Live, and UOPs. With its latest NVIDIA CUDA technologies, it works smooth and fast. 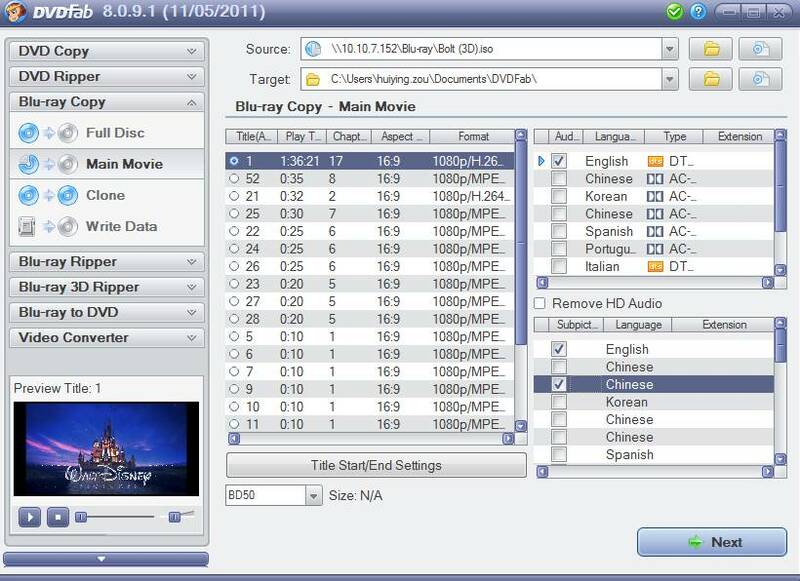 Copying Blu-ray disc is just one of the many features of the Blu-ray Copy Software. There are still many features provided with the software. If you have blu-ray data or iso image file stored on your hard disk, the software can burn it on any blank blu-ray disc as well as on any blank DVD like DVD+R/RW, DVD-R/RW, DVD+R DL and DVD-R DL. Still need more? It can also burn blu-ray data on AVCHD disc. With its capability to copy blu-ray disc to another blu-ray disc with 1:1 ratio, Blu-ray copy even provide a way to compress the data and copy it to lower layer disc with high quality output. Additionally, you can also convert HD audio to save space. It can convert Dolby TrueHD to Dolby AC-3, DTS-HD audio to DTS. With four different copy mode even a first time user will find it smooth to copy the blu-ray disc. Full Disc – Full Disc mode as its name suggest will copy the whole contents including all titles, menus. Main Movie – If you want to copy only the longest title, Main Movie mode will do for you. Clone – Clone mode will make a same copy of blu-ray without any modification in 1:1 ratio. Write Data – Write Data mode will simply burn the blu-ray folder or an ISO image to disc. It also converts blu-ray folder to ISO image. A user friendly interface provides step-by-step setting layout to set write speed, burning engine, encoding speed, audio and subpicture tracks. It also supports multi-language with auto updation. You can also view the process live with inbuilt Blu-ray preview window. DVDFab Blu-ray copy is best suited solution for copying a blu-ray disc with high quality output. It is available in both Windows and Mac operating systems. Blu-ray copy saves your data from being misplaced or lost.